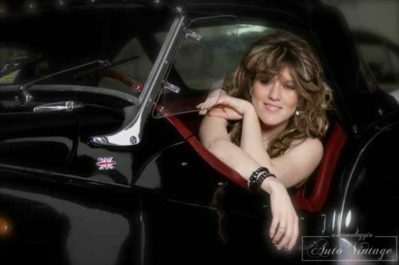 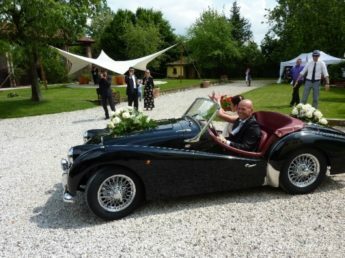 Black color with red leather interior, to be caressed by the wind in a beautiful vintage spider with the typical charm of the English car. 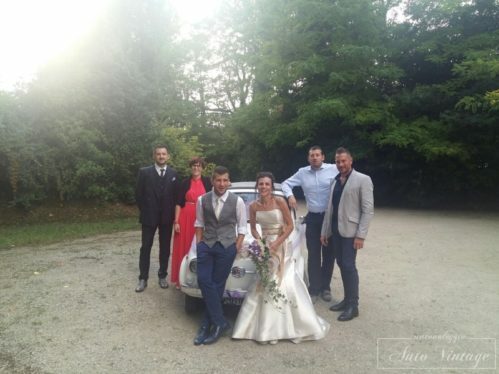 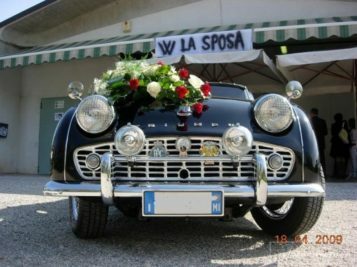 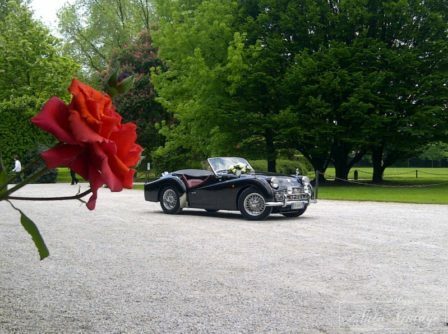 The TRIUMPH TR3 that we propose is similar to the car used by Marcello Mastroianni in the legendary film by Federico Fellini “La Dolce Vita”, black with red interiors ……. 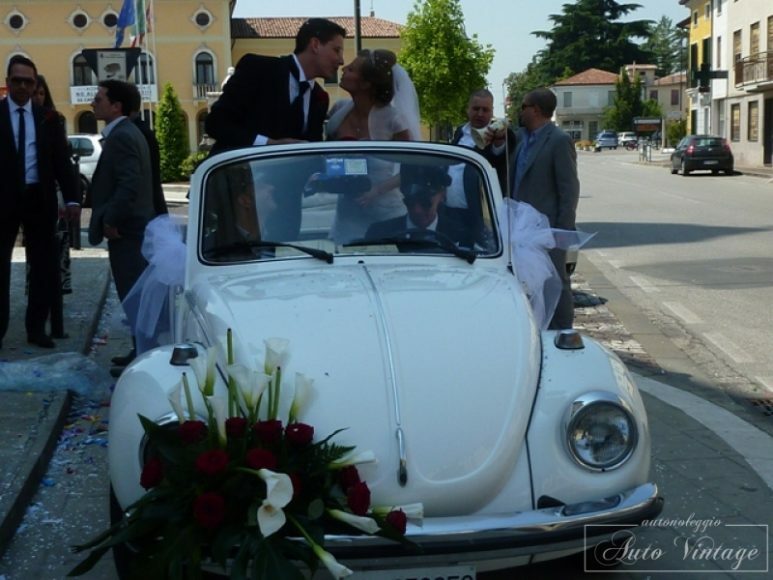 – Our assistance staff for the entire duration of the rental. 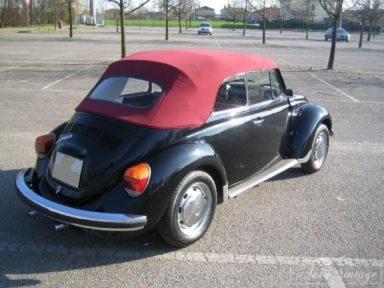 – The use of a substitute car of the type Sedan or Cabrio (car not closed Spider) in case of adverse weather forecasts. 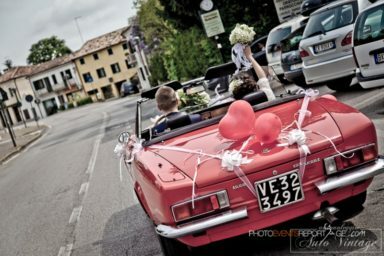 It is possible to take advantage of the delivery and collection of the car on site at the end of use. 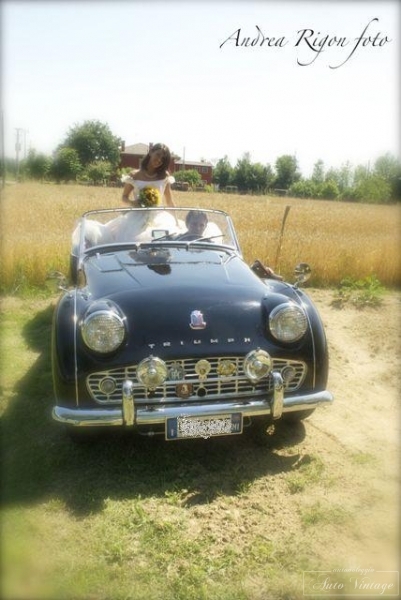 The TR3 (abbreviation of Triumph Roadster 3) was a passenger car produced by Triumph from 1955 to 1962. 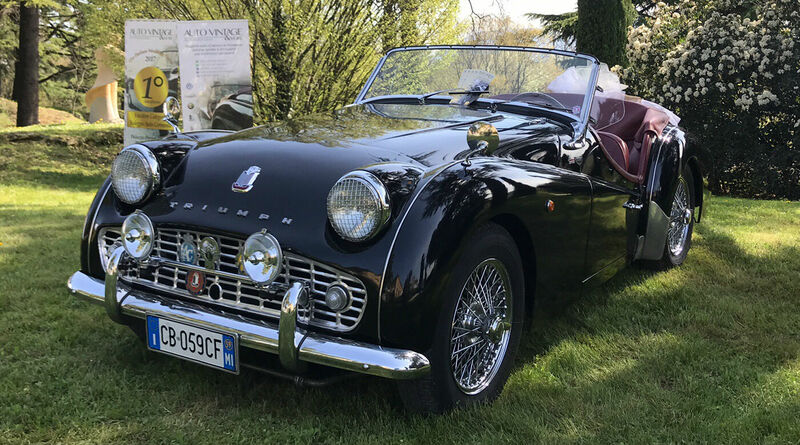 The updated version, known informally as TR3A, went into production in 1957 while the final version, called (unofficially) TR3B, was assembled only in 1962. 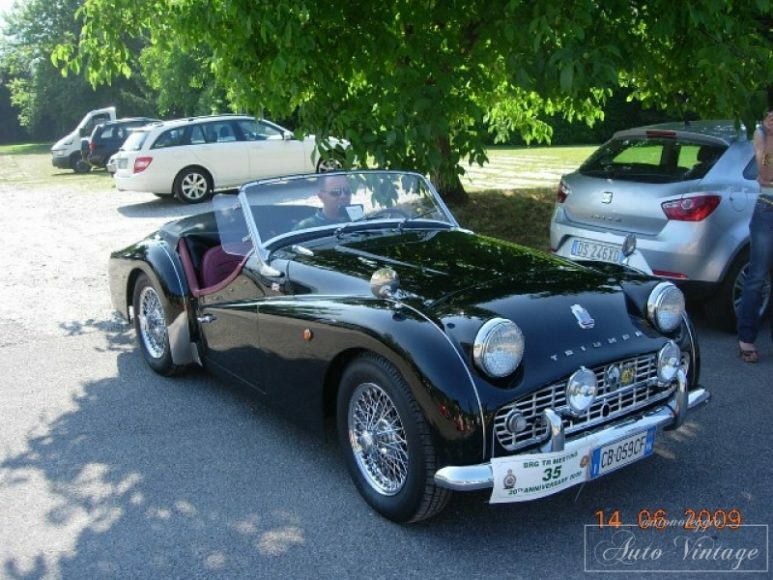 The TR3 was part of the category of British roadsters with front and rear-wheel drive. 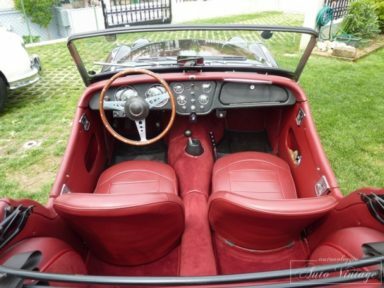 The TR3 was assembled in Coventry (England), Melbourne (Australia), Liège and Malines (Belgium)  and in South Africa . 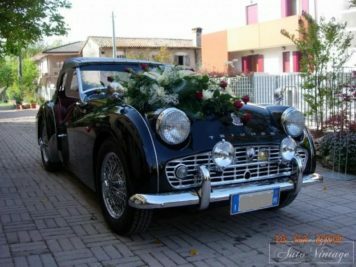 In 1957 the TR3 was updated with several changes that included, among other things, a wider grille (hence the nickname “wide mouth”), slightly recessed headlights, door opening handles and a complete equipment that included many components that on the original version they were not offered as standard. 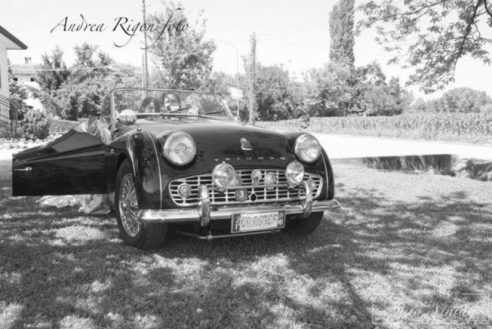 The revised model was named “TR3A” even though the car was never branded with this name, and the name “TR3A” was never officially used . 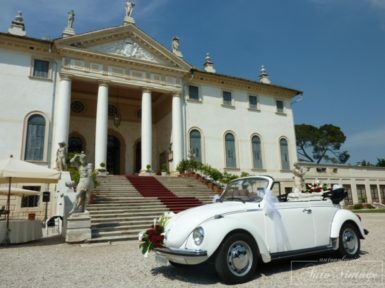 In fact, this name does not even appear on the brochures . 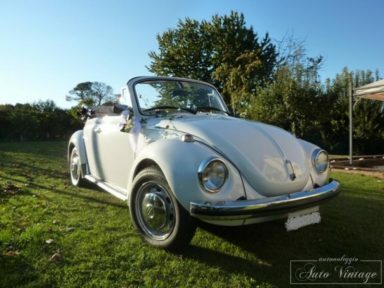 The power of the engine grew to 100 hp SAE thanks to the upgrade of the head and the enlargement of the intake ducts, ensuring the model performance, for the time, excellent. 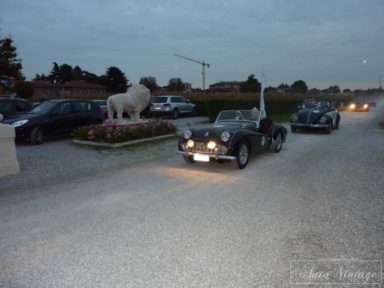 The total production of TR3A was 58.236 units. 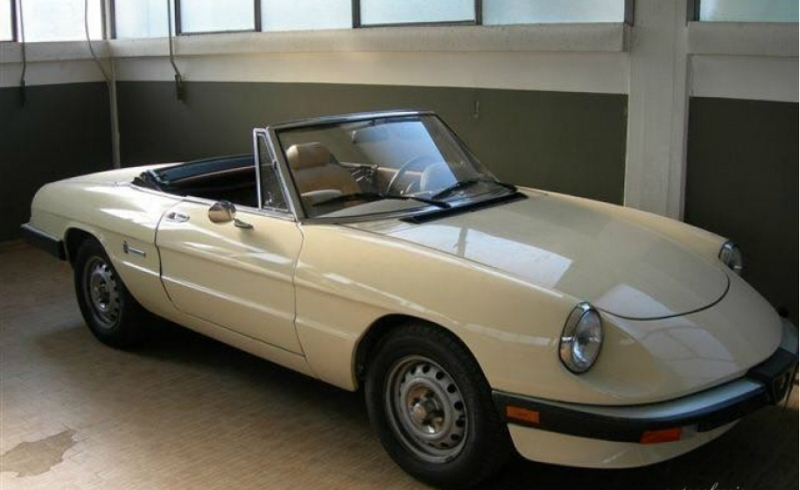 These sales volumes made the model the third best-selling TR after the TR6 and the TR7. 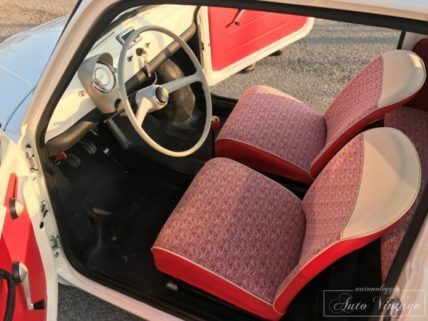 In June 1977 the US specialized magazine Road & Track published an article entitled “Driving Impressions: TR3A & TR250” (ie “Driving Impressions: TR3A & TR250”). 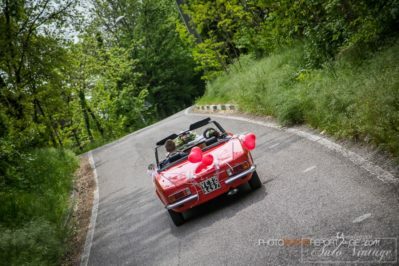 The recorded performances were an acceleration from 0 to 97 km / h of 12 seconds, a power output of 100 hp at 4,800 rpm and a fuel consumption of 10 L / 100 km . 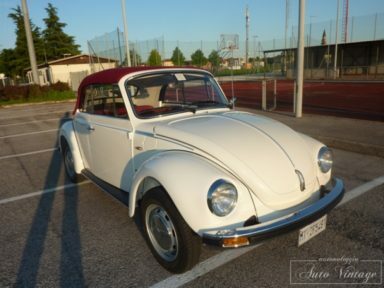 With this car Andrea De Adamich, Richard Attwood and Timo Mäkinen began their car career. The TR3A are then the protagonists of successful films at the turn of the fifties and sixties: in La dolce vita with Marcello Mastroianni at the wheel (who then bought one for himself) and also in Le like Brahms? 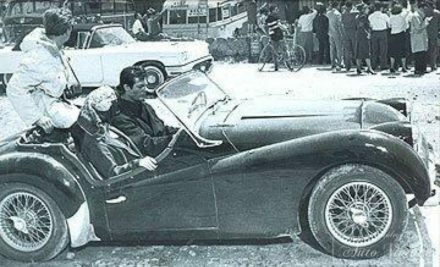 with Ingrid Bergman, Anthony Perkins and Yves Montand. 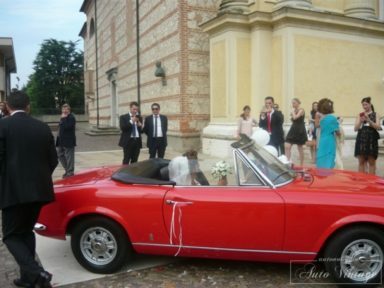 Red color with black interior, carbed by Pininfarina. 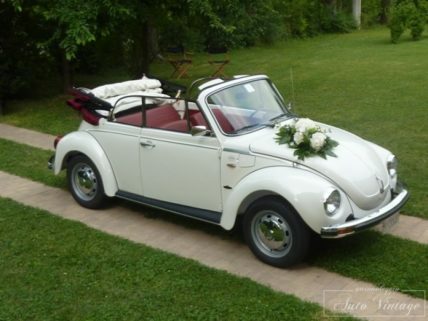 A classic of other times, for a dynamic couple outside the box. 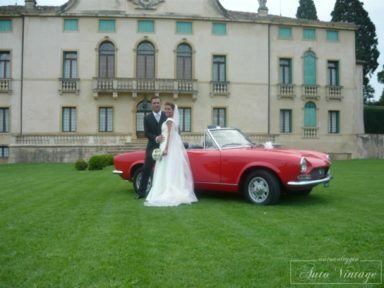 – Delivery and collection of the car on site. 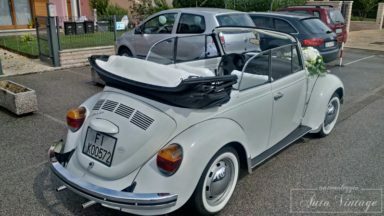 – The use of a substitute car of the type Sedan (car not closed Spider) in case of adverse weather forecasts. 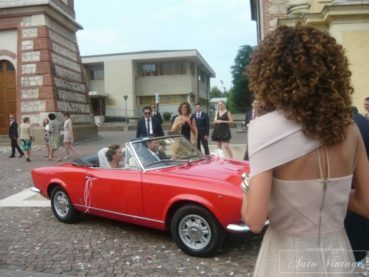 The Fiat 124 Sport Spider is a 2 + 2 convertible sports car produced by FIAT from 1966 to 1985. 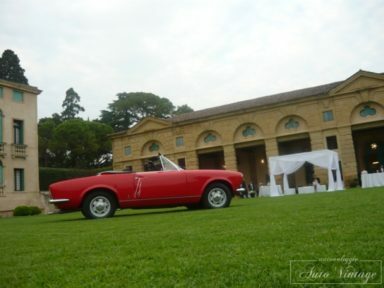 Presented to the public in November 1966 at the Turin motor show, its production was mainly exported to the United States of America. 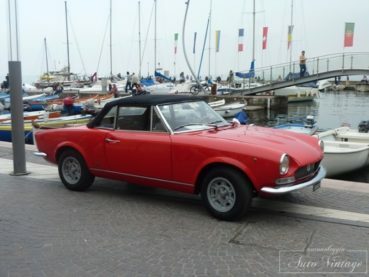 Following the success of the Fiat 124 were prepared the sports versions of the car, the 124 Sport Coupé and the 124 Sport Spider. 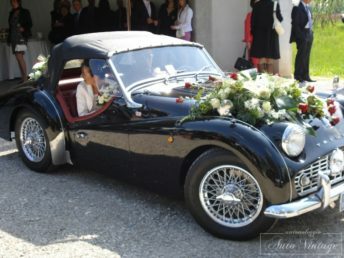 The coupe and the spider were related to the 124 saloon version in the name and through the use of a lot of mechanics and, in the case of the coupe, also the floor. 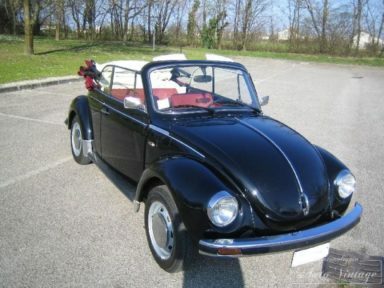 The “Sport Spider” was built on the shortened chassis of the sedan and was equipped with a twin-shaft 4-cylinder engine of 1438cm³ powered with a dual-body carburetor, with control of the distribution, avant-garde for the time, with rubber toothed belt, capable of delivering 90 hp at 6500 rpm and giving the car a declared top speed of 170 km / h (actual speed from the “Quattroruote” road test – May / 67 -: 173 km / h). 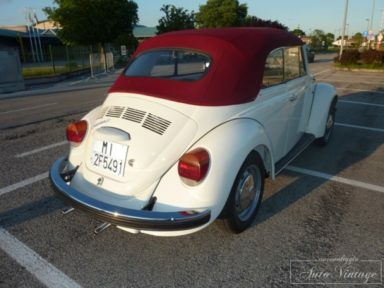 It had a rigid bridge rear axle modified at the points of attack (two pairs of longitudinal struts, in place of the previous “cross” pattern, to improve the driving precision) and the standard power brake. 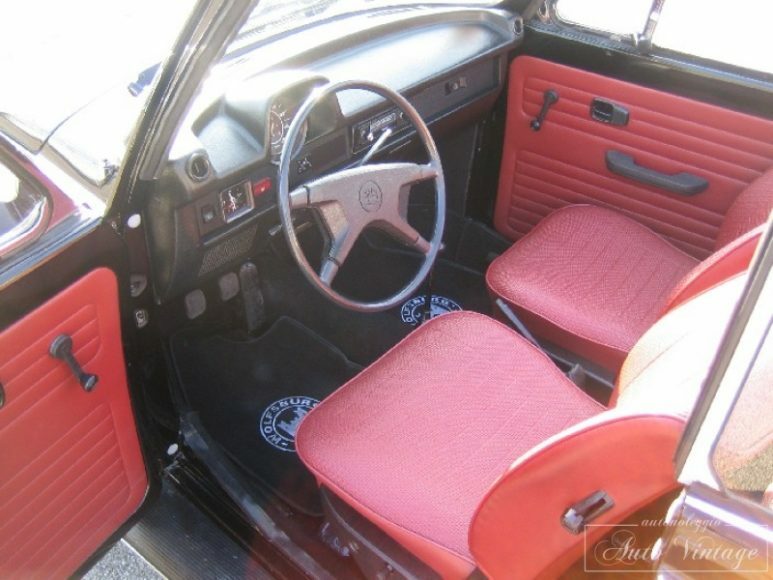 A new 5-speed gearbox was also made available as standard. 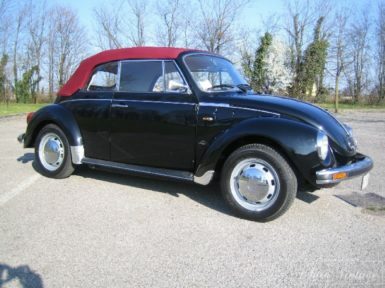 In fact, these two new models replaced the previous sports models “1500 S” and “1600 S” just taken off production. 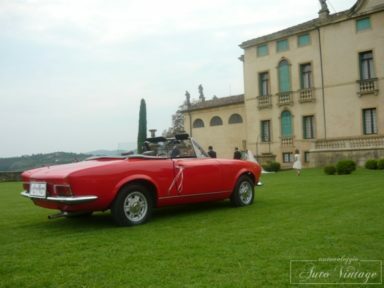 The spider was designed and also produced by Pininfarina, the style is the work of Tom Tjaarda. 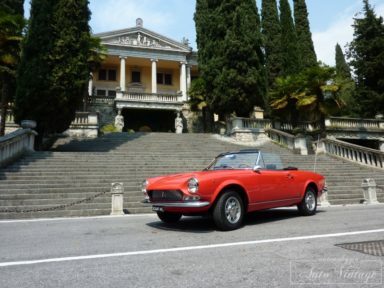 The coupe and the spider were sold for the first time in the United States of America since 1968. 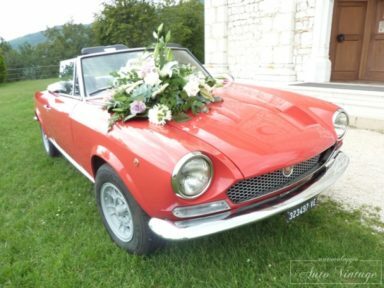 In 1969, the 124 Spider was the most affordable twin-engine, four-wheel disc brakes, intermittent wipers, steering column lights, radial tires and five-speed manual gearboxes. 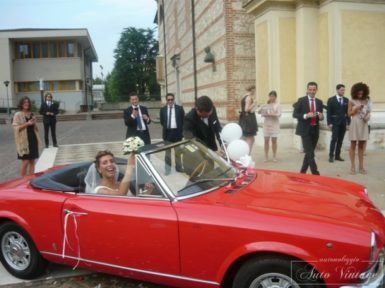 The car was rear-wheel drive. 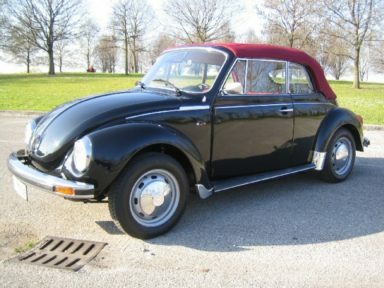 In 1969 the second series was presented (recognizable by the humps on the bonnet), while in 1972 the third series was released on the market. 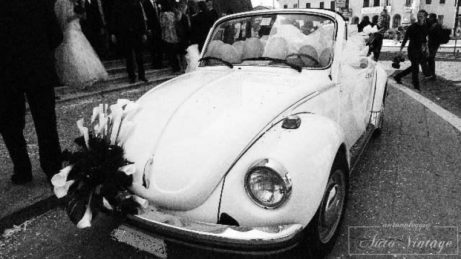 The suspensions were of a conventional type: the front axle had independent wheels, with trapezoidal and helical springs, while the rear axle was a rigid axle with longitudinal reaction struts and coil springs. 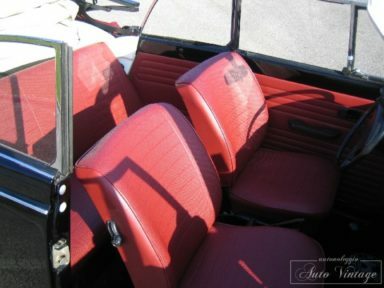 On each axis there is a stabilizer bar and a pair of telescopic hydraulic shock absorbers. 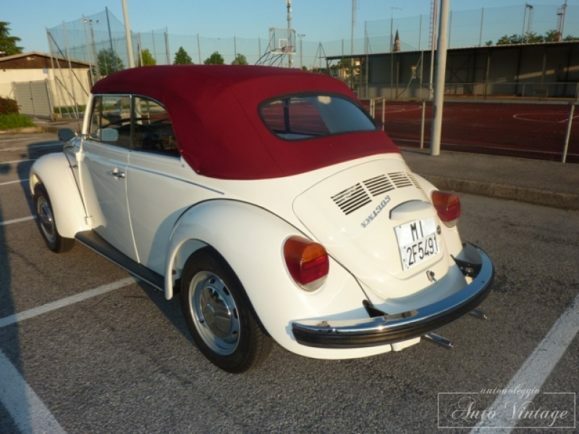 White color with red interiors, emblem of Italy all over the world! 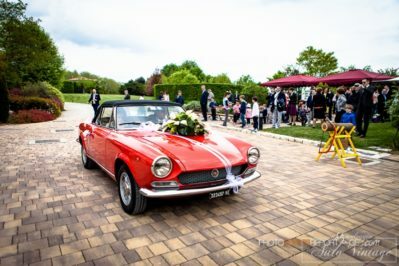 Delivery and collection of the car on site. 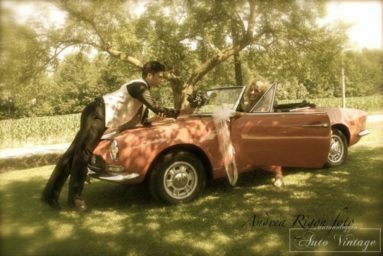 Our assistance staff for the entire duration of the rental. 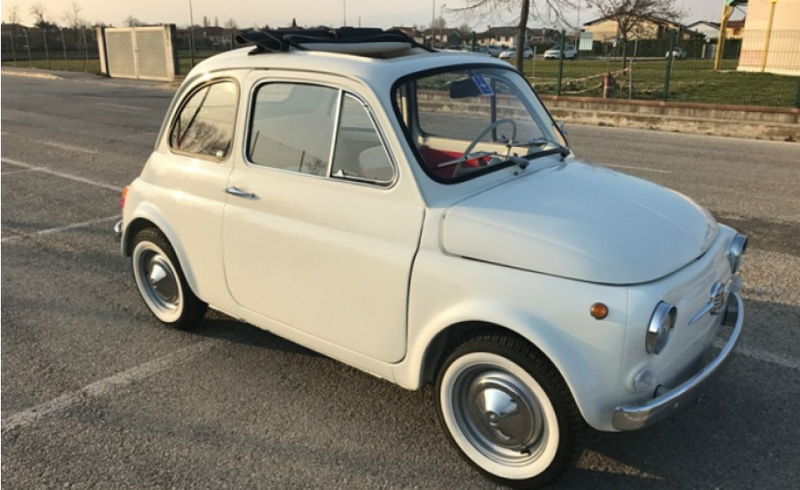 In 1965 the New 500 F was presented, heir to the “D”, destined to become over the years the version with the largest number of units built. 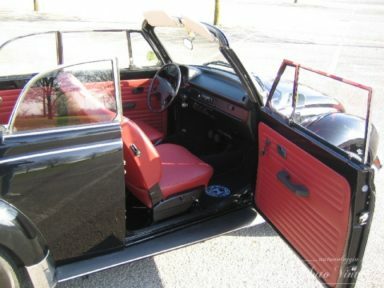 The innovations are above all aesthetic: the most evident inversion in the opening of the doors, hinged with 8 screws per door from which the term “eight bolts” that distinguishes the first F from March 1965 until January 1966, or with chassis number just over one million (this version is very sought after today due to a production lasting only “10 months”) where it will then go on to the classic hinging with 4 screws per door. 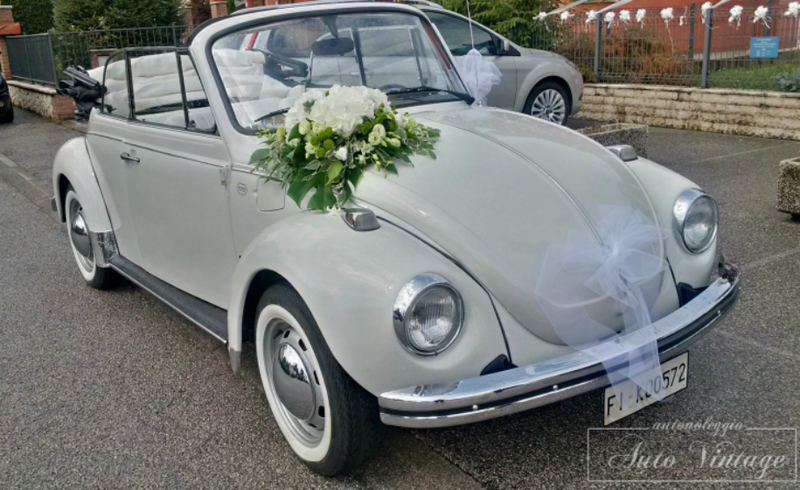 This change, in 1965, was due to the Highway Code which imposed the hinging of the front doors for all models, for greater safety. 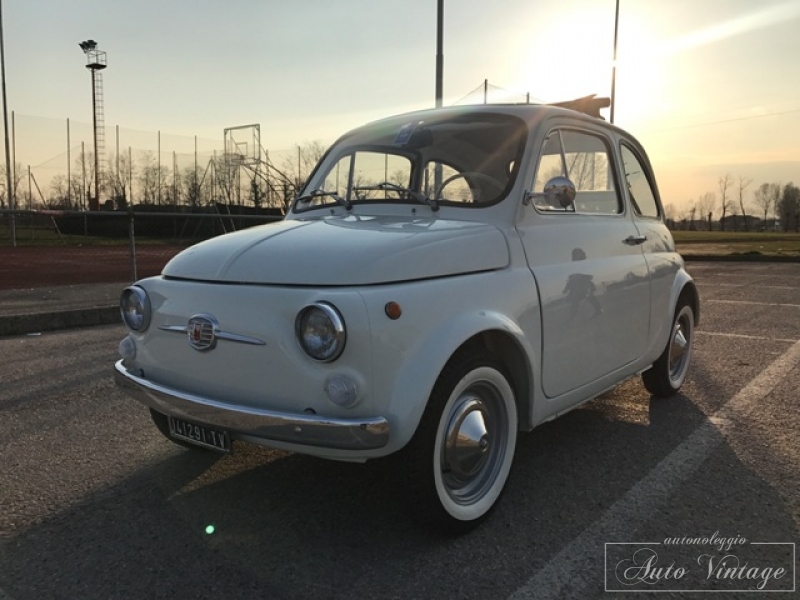 The FIAT therefore also adapted the 500 sedan, but not the Giardiniera, which maintained the unchanged opening throughout the production (until 1977), as the Code provided an exemption for commercial vehicles. 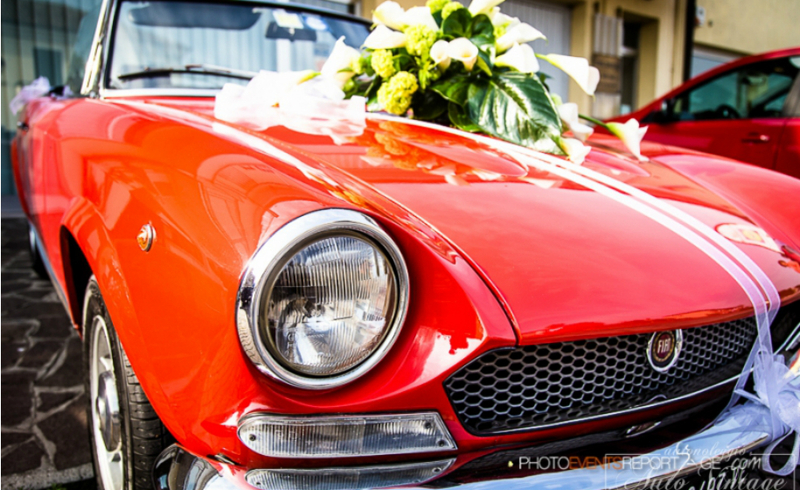 It is also the beginning of the plastic era, which replaces numerous sheet metal and metal parts. 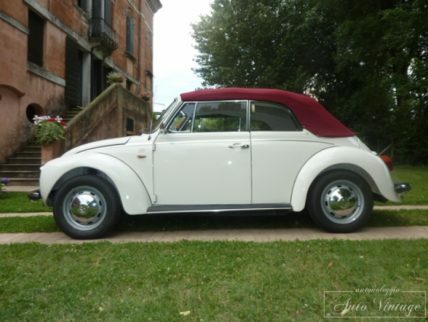 The bodywork is reviewed much more than it seems by the inversion of the doors. 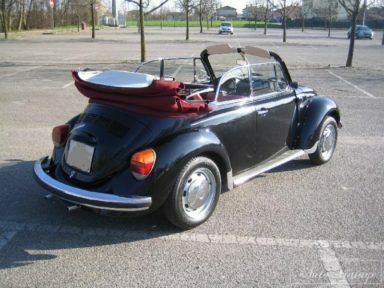 In practice, only the bonnet and the front part remain of the 500 D shell. 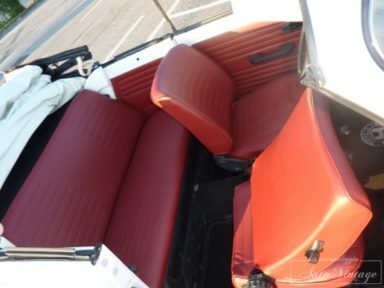 Other important details also change: the windscreen is wider and offers greater visibility; the roof is built in one piece with the uprights and no longer bolted to the columns; the front frieze of the mask is made of a single piece of plastic (from 1966) and no longer has the separate aluminum mustache; the door handles are chromed and their shape is suitable for the new type of opening; the wheel covers (or cups) are in steel (since 1967) and no longer in polished aluminum; the headlights have chromed metal frames (since 1966) instead of aluminum and use asymmetrical beam projectors; the position lights lose the aluminum bases like the rear lights, now of a more squared shape; the hood closes with a single black plastic central hook instead of the two small metal hooks located on the two sides of the roof; the aluminum profile on the front bonnet and the moldings on the sides are eliminated; the three dashboard switches (lights, panel lighting, windscreen wipers) are aligned along the dashboard; the glove pocket is made of plastic and has larger dimensions; the tank is no longer an onion but a half cylinder and its capacity rises to 22 liters; the license plate light is plastic (since 1966). 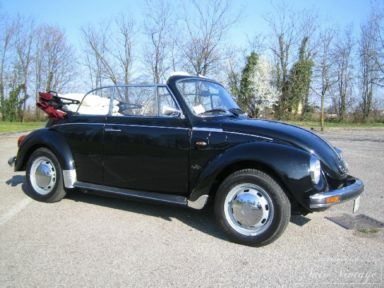 The engine is still revised in the timing and delivers 18 hp. 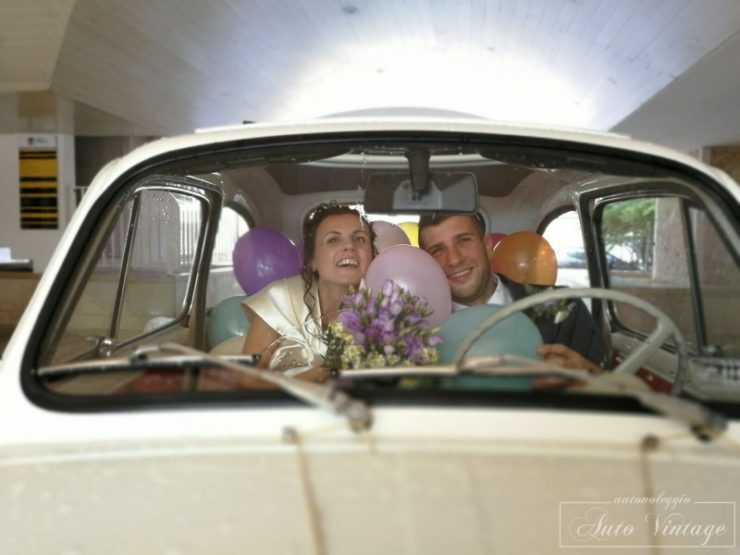 The suspensions are strengthened and the axle shafts are larger in diameter. 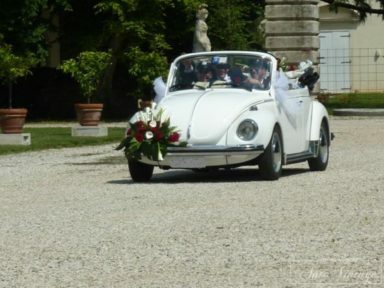 The braking system is also upgraded and adopts larger cylinders. 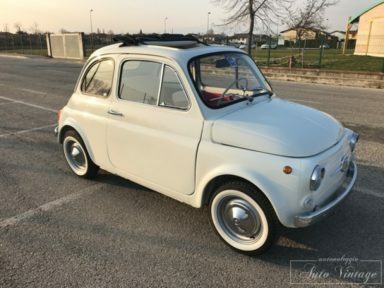 Initially, the 500 F adopts some pieces of the old D, waiting for the equipment of new details and to exhaust the old stock of FIAT (something quite common at the time). 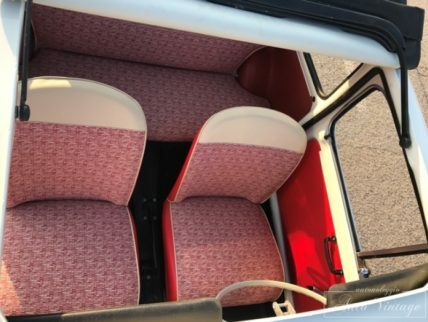 Until July 1965, in fact, it still mounts the front direction indicators with aluminum base and the front seats with elastic bands that will then be replaced by those with springs. 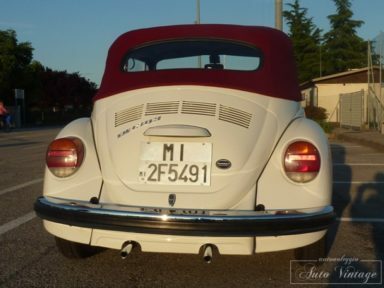 In the summer of 1966 (up to Chassis 1,211,123) the muffler is no longer as a drip like on the D, but with overlapping half-shells (recognizable by the rounded ends) and the plate light is made of plastic and no longer polished aluminum. 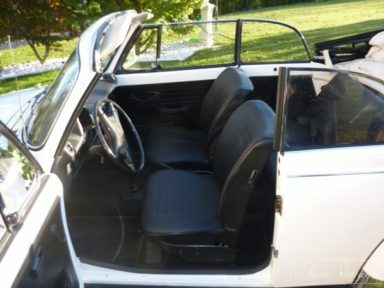 Until the last months of 1966 the windshield wipers are still “tight”, and the small castle on the starter air linkage tunnel is bolted with 2 screws (which will become one). 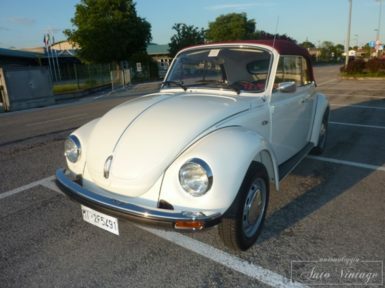 The engine air grille is initially 6 screws and then moved to 3 between March and April 1966. 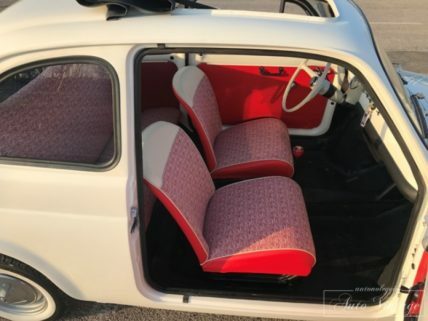 There was therefore a small interserie called “6 screws” produced for about 3 months (January – April ’66) with hinged doors “4 bolts” and 6 screws air grille. 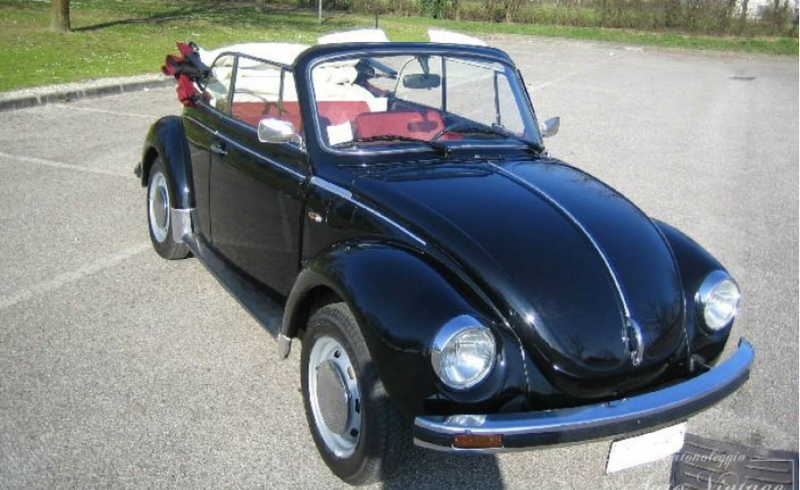 In October 1968 some changes appear to coincide with the arrival of the “L” version that will support it. 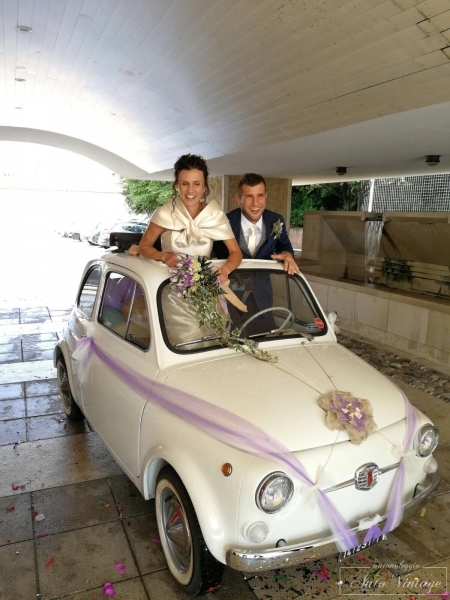 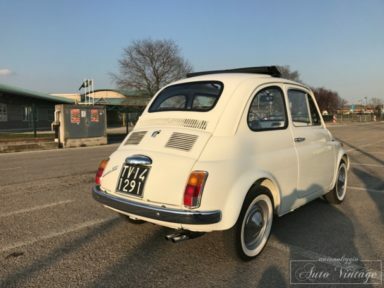 The writing “Nuova 500” disappears on the rear bonnet and a horizontal plate appears, with bars, with the inscription “Fiat 500” and the seats lose the beige top bezel and become a solid color. 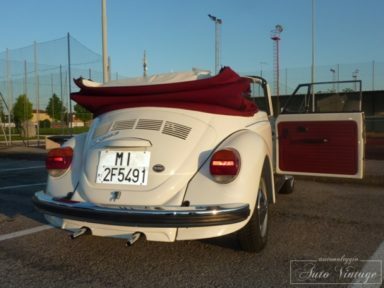 Since February 1970 the license plate light (as on the L) is moved higher. 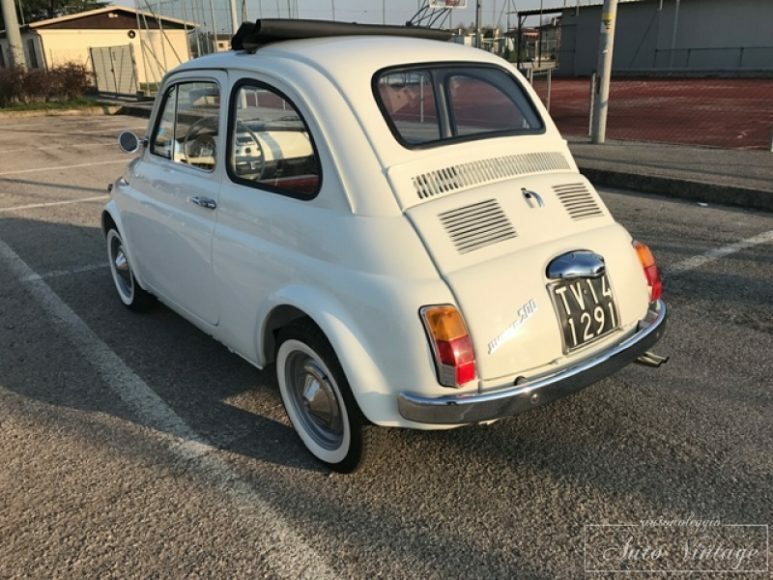 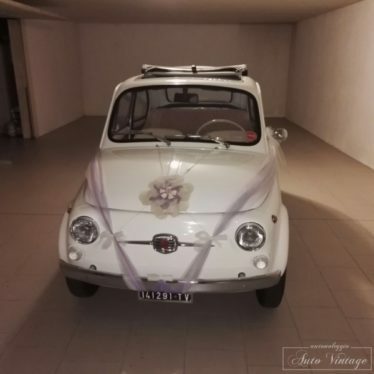 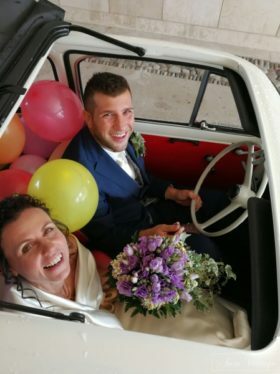 The production continues in parallel with that of the L until November 1972, when the latest version of the “small big car” is marketed, the 500 R.
Maggiolone Cabrio white with white interiors, a splendid car recently restored. 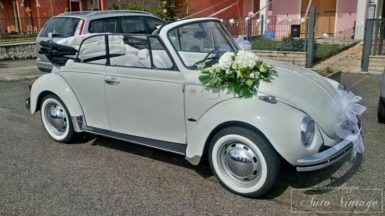 It is possible to take advantage of the delivery and recovery of the car on site at the end of use. 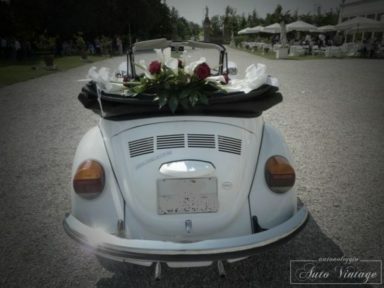 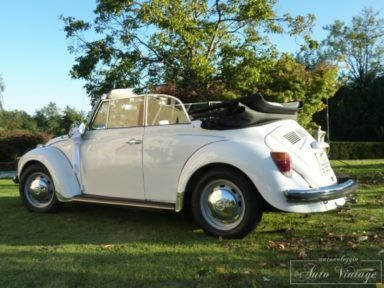 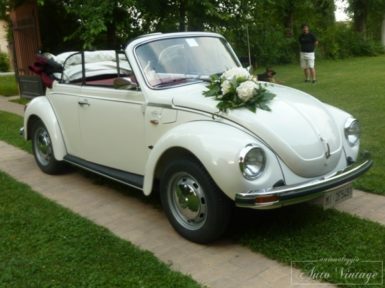 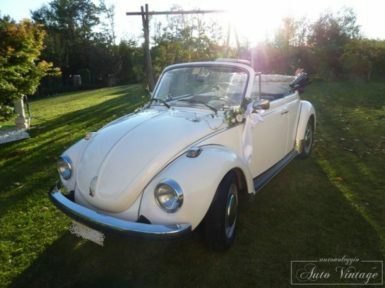 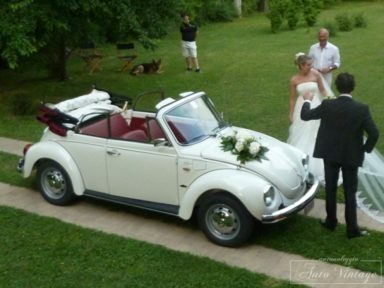 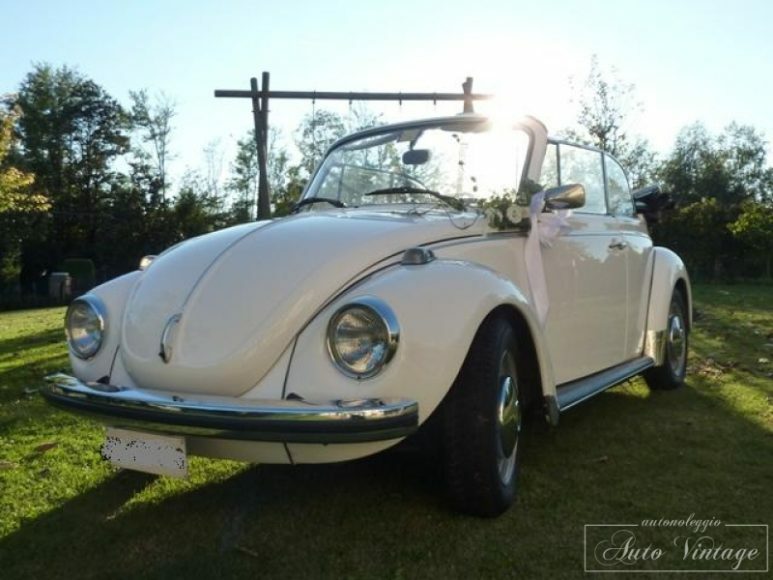 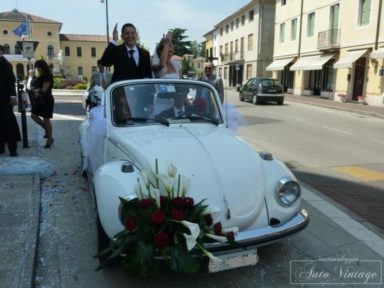 The Volkswagen Typ 1, better known as Beetle if in version Typ 1/113 M15, or Beetle, if in the version 1/1302 in Italy (Käfer in German, also called Coccinelle in France, Escarabajo in Spain, Beetle or Bug in Gran Brittany and the United States, Fusca in Brazil and Vocho in Mexico), is a compact car produced by Volkswagen from 1938 to 2003. 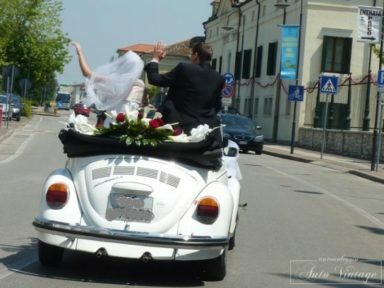 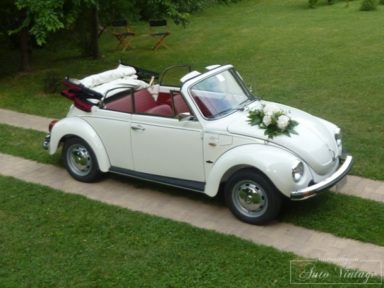 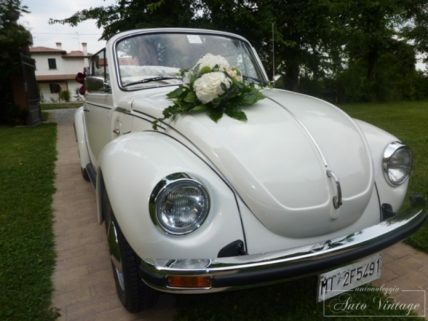 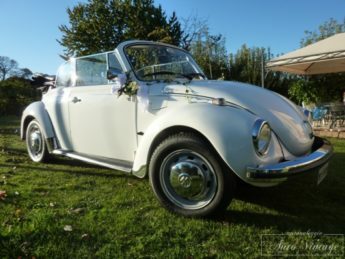 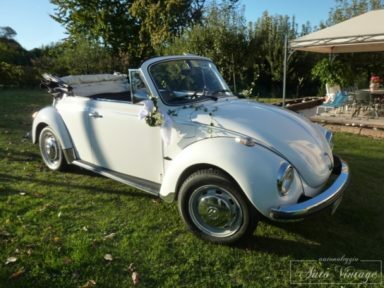 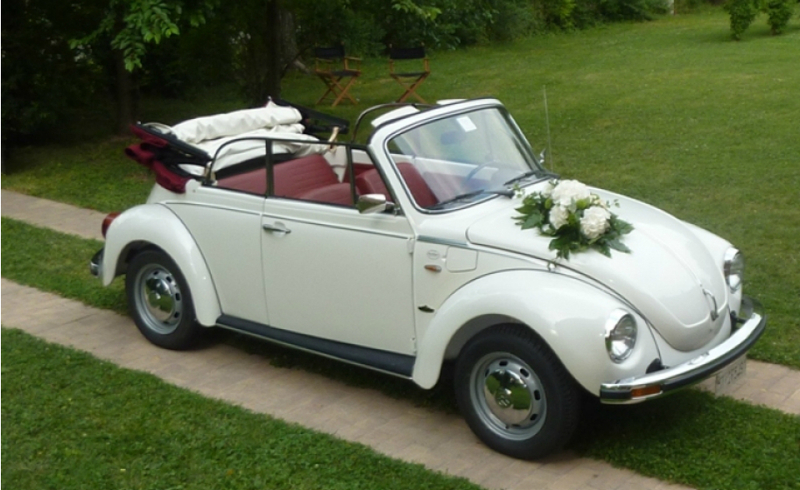 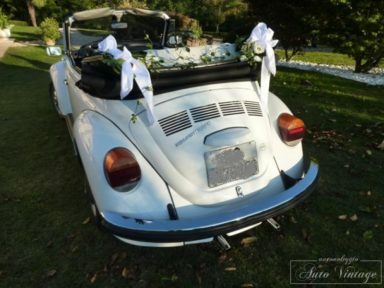 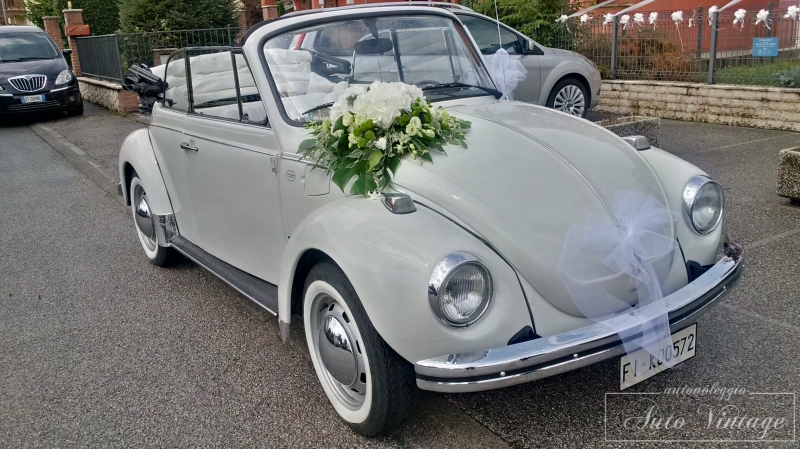 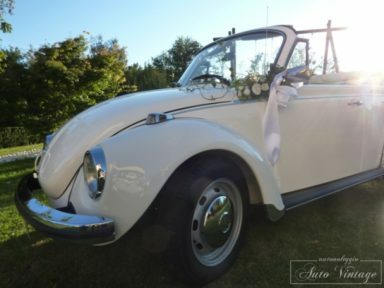 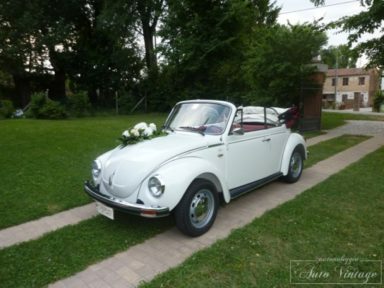 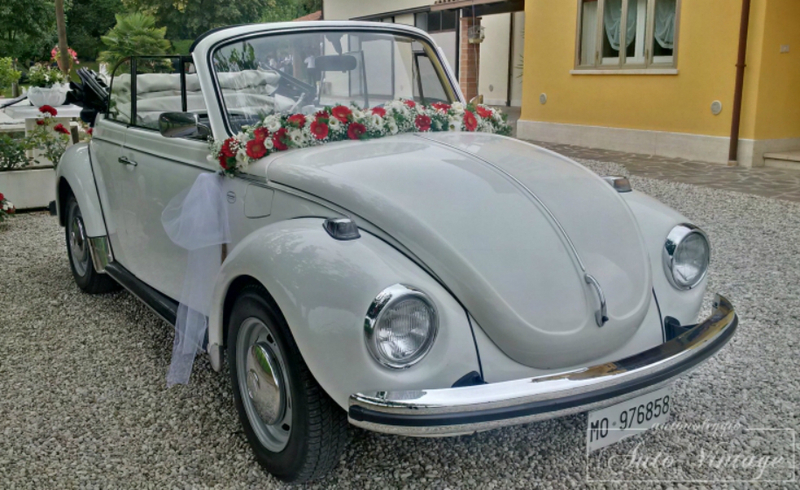 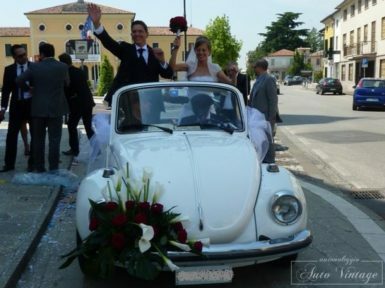 The Beetle is definitely the most famous German car in the world, symbol of the German industrial rebirth after World War II, as well as the first ever Volkswagen model. 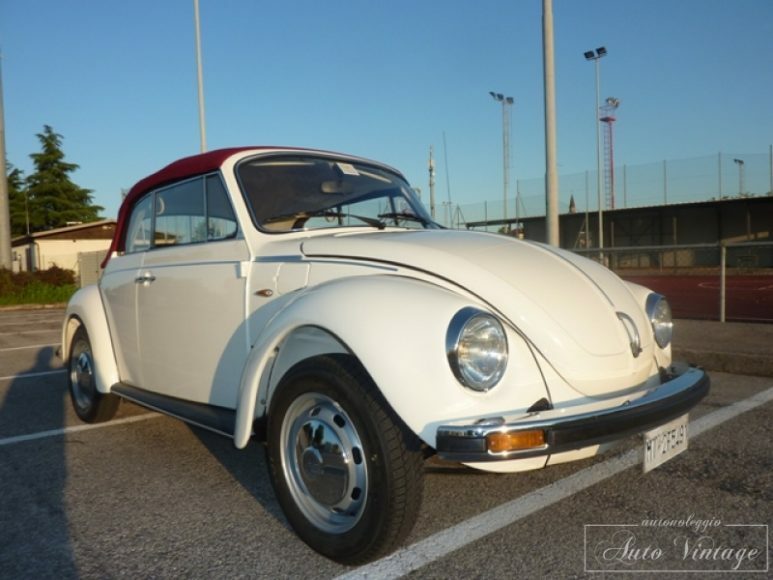 It currently holds the record of the longest-running cars in the world, having been produced continuously for sixty-five years. 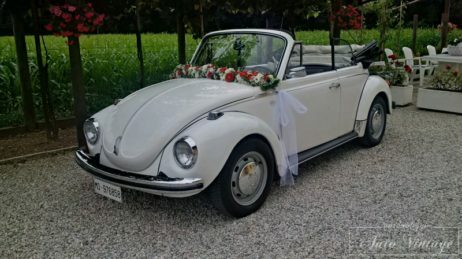 In addition, it has long held the world’s best-selling car record, with 21,529,464 units, and is currently the fourth car in the world for the number of models produced, after Toyota Corolla, Ford F-150 and Volkswagen Golf. 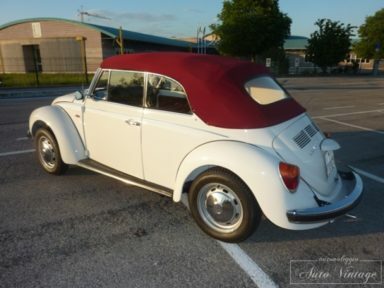 In 1999 it was named among the five most influential automobiles of the twentieth century. 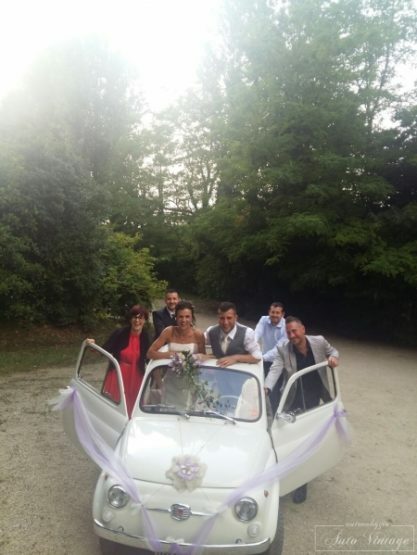 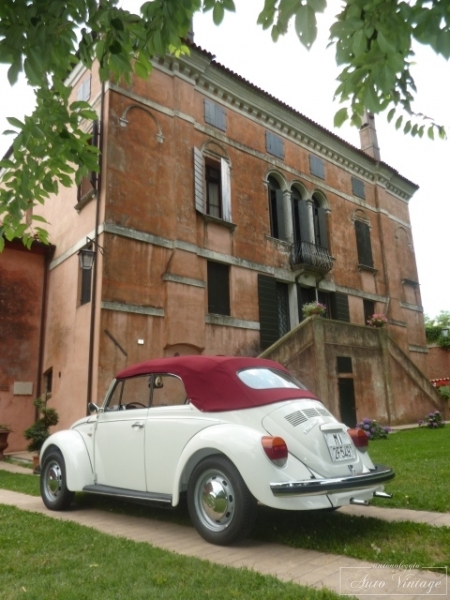 For its planetary diffusion, it is one of the first examples of the world car. 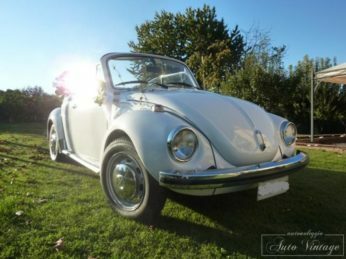 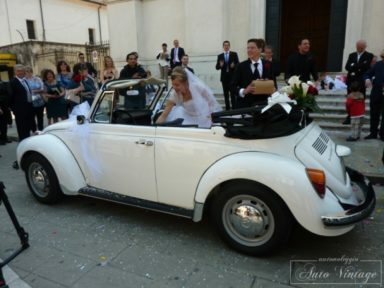 The Beetle had a modern re-edition in the New Beetle, a retro model that went into production in 1998 and was followed by the Beetle in 2011, both produced in the Mexican factory in Puebla, but its heritage of family cars was actually collected by the Golf in 1974, that matched and then exceeded the Beetle sales record. 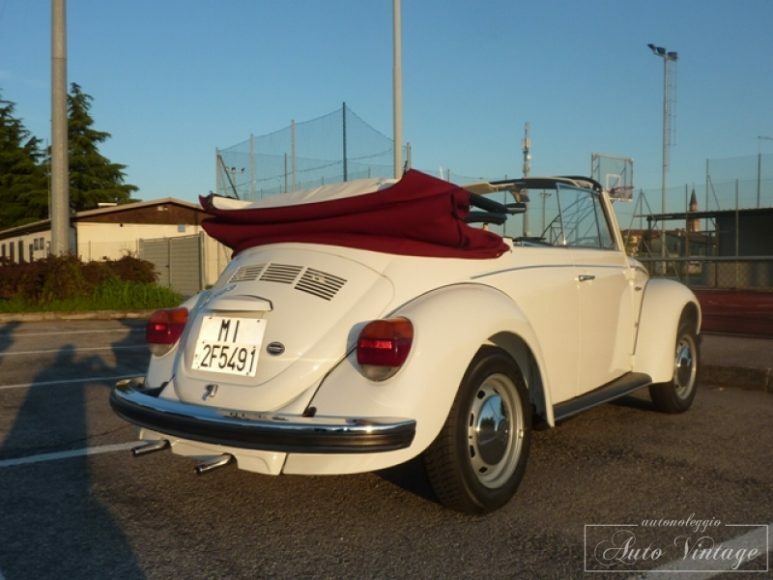 Maggiolone Cabrio white with interior and red burgundy coat, a unique edition of its kind. 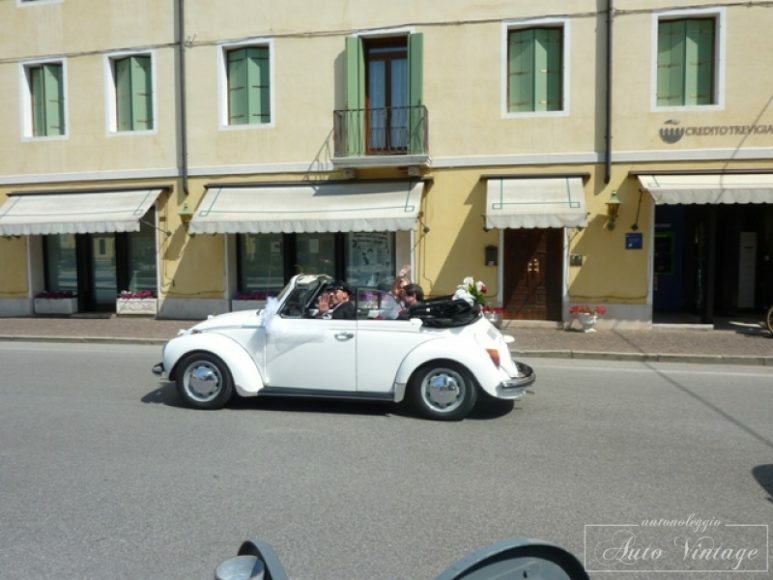 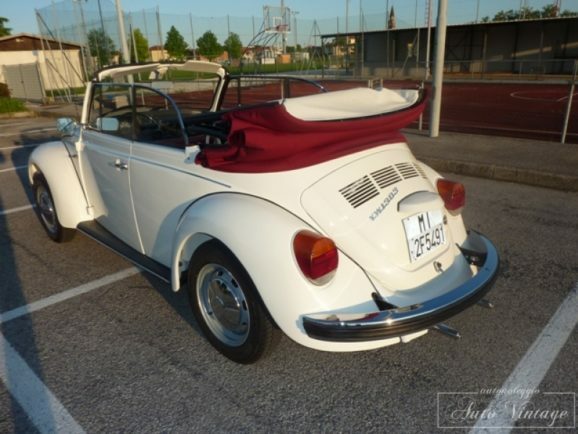 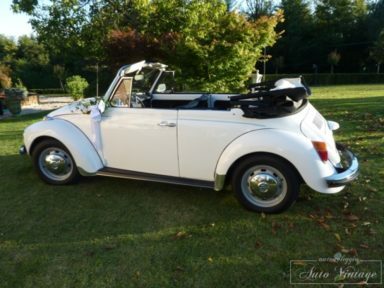 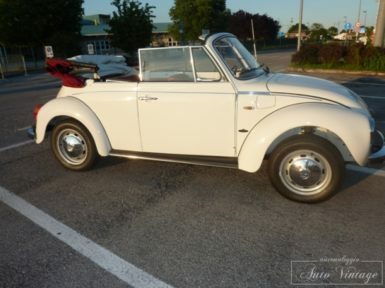 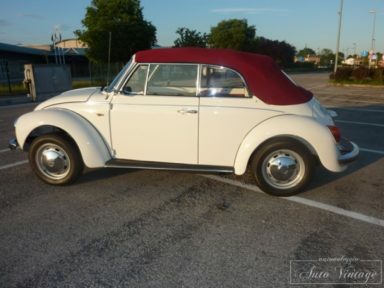 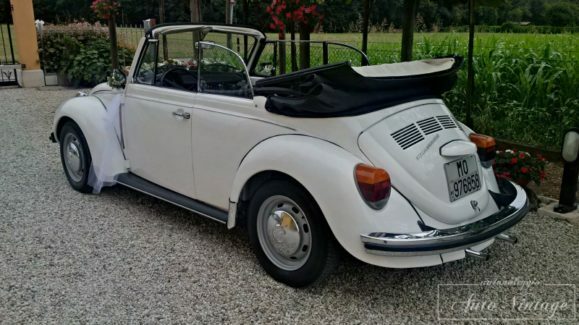 Maggiolone Cabrio white with black interior, a splendid car recently restored. 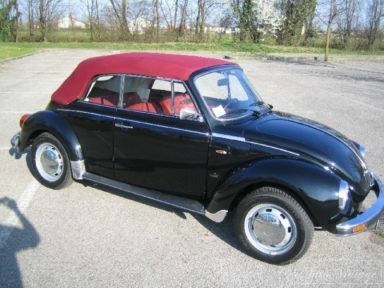 Maggiolone Cabrio black with red burgundy interior and coat, a unique edition of its kind. 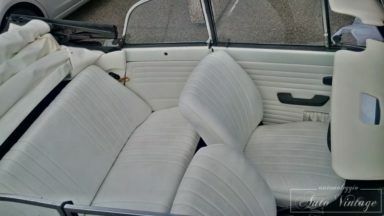 Beige color with black interior, carbed by Pininfarina. 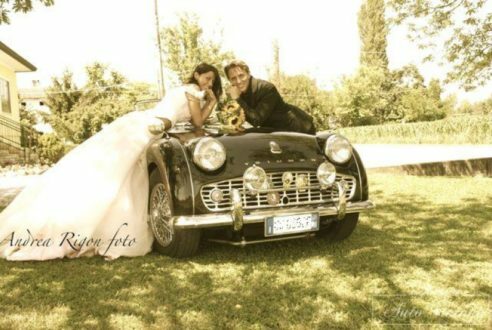 A classic of other times, for a dynamic couple outside the box. 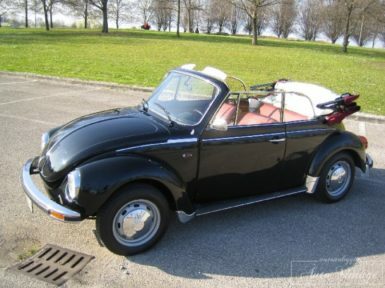 The use of a substitute car of the type Sedan (car not closed Spider) in case of adverse weather forecasts. 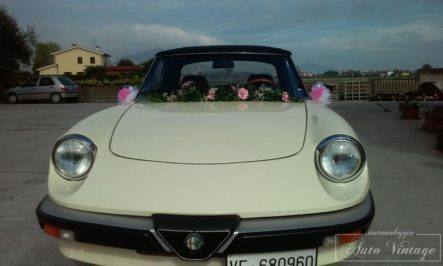 The Alfa Romeo Spider, commonly known as “Duetto”, is an open car produced by Alfa Romeo between 1966 and 1994. 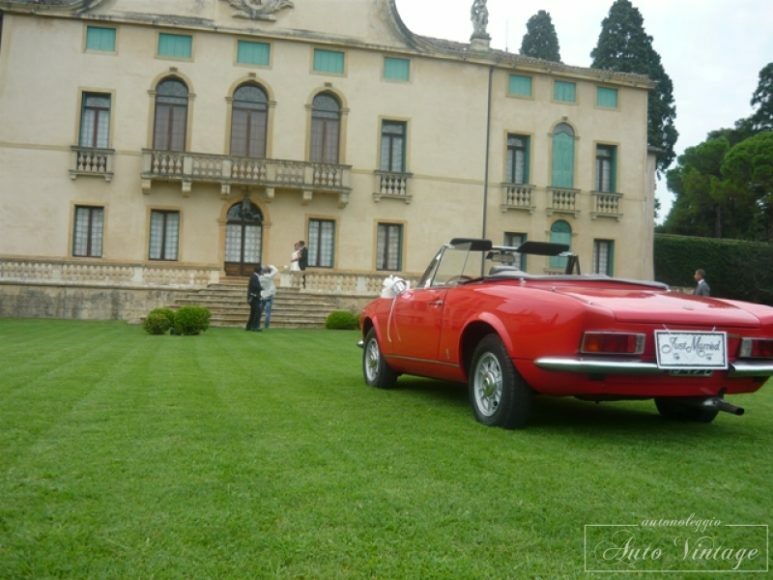 It is one of the best known models and is the longest-lived in the history of the Milanese house, with 28 uninterrupted years of production, divided into 4 successive series. 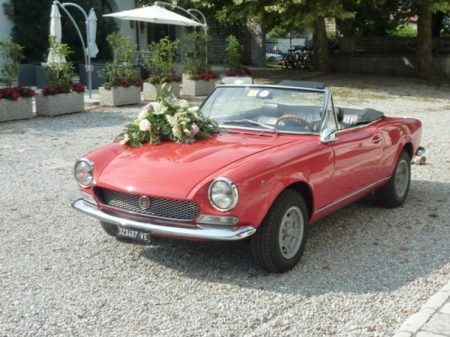 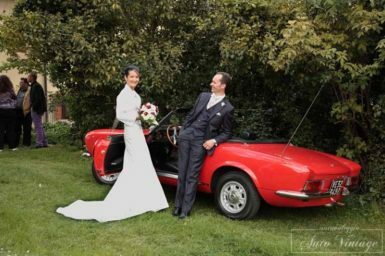 The huge sales success achieved by the 1962 “Giulia” model, replicated by the coupe version in the following year, prompted the Alfa Romeo management to quickly complete the range with the spider version, in order to make the most of the favorable commercial moment. 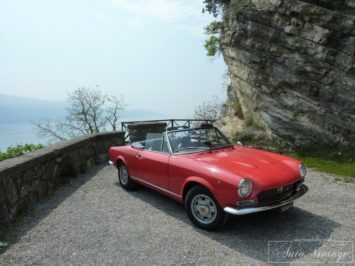 In 1964 the task of outlining the spider version was entrusted to Bertone who prepared the prototype of the “GTC” model, designed by Giorgetto Giugiaro, then produced in series by the Touring Carrozzeria and put on sale in 1965. 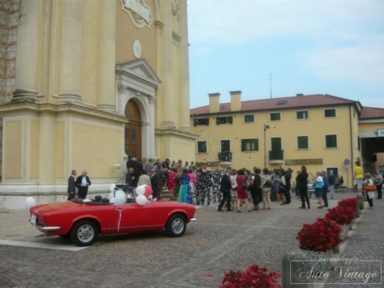 The lukewarm welcome from the market to the new “GTC” convinced the House of Arese to find an alternative solution. 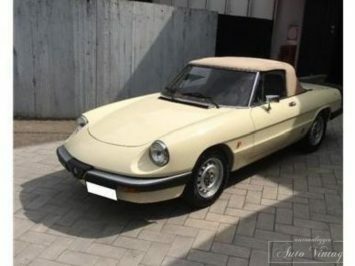 The change of course was drastic, also determined by the fact that the production potential of Carrozzeria Bertone was almost completely absorbed by the order obtained by FIAT for the construction of the “850 Spider” model and that the Carrozzeria Touring sailed in bad waters and it was easy to predict the imminent closure. 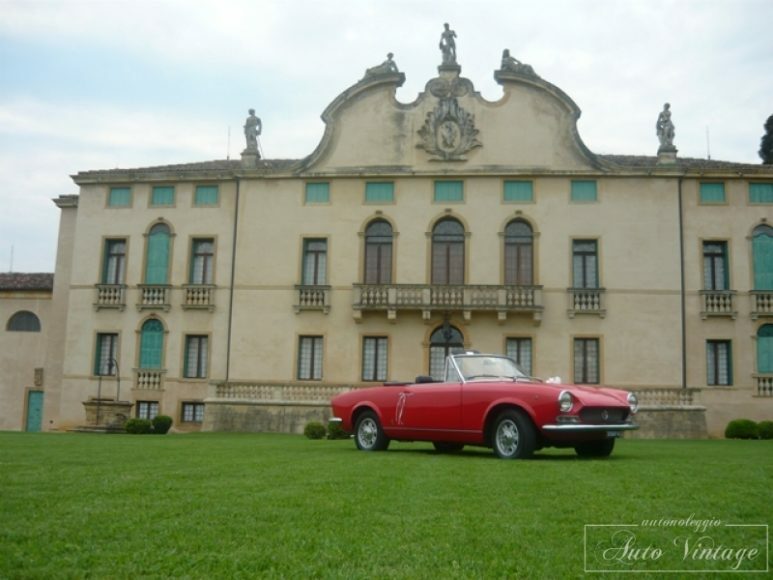 In 1965 Pininfarina was commissioned to dress the new spider. 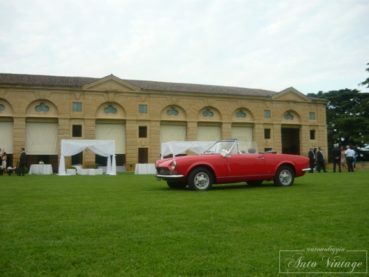 In the previous decade, it had created a series of interesting stylistic proposals on the “6C 3000 CM” chassis, in order to give a production outlet to the famous “Disco Volante” prototype. 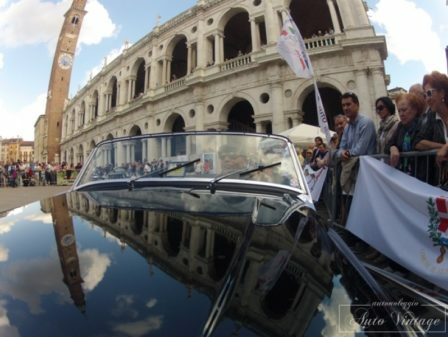 These proposals had begun with the dream car “Super Flow”, presented at the 1956 Turin Motor Show, followed by the “Super Flow II” version and subsequent developments, commonly dubbed “Super Flow III” and “Super Flow IV”, until the “Super Flow V” of 1961. 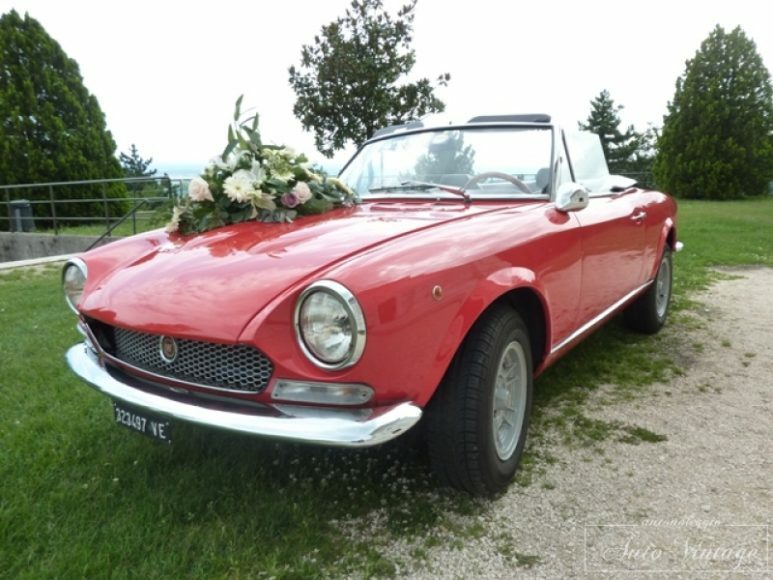 Starting from that stylistic base, a group of Pininfarina designers, led by Aldo Brovarone and supervised by Franco Martinengo, created the sketch that obtained the immediate prior approval of the Alfa Romeo management. 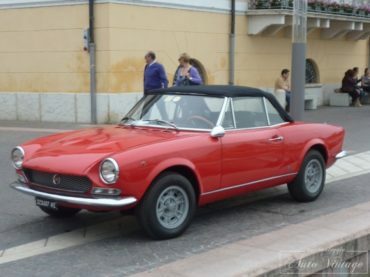 The evolutionary path of three-dimensional refinement, from the maquette to the definitive prototype, passing through the construction of the bodywork mask, was constantly followed by Battista Pininfarina who made, and in some cases, personally made, dozens of small changes that were decisive for reaching the formal masterpiece represented by the “Duetto”. 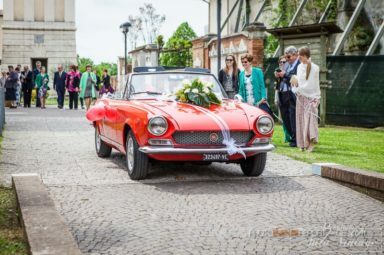 It was the last car born under the aegis of the great Turin coachbuilder who died a few weeks after the public presentation of the “Duetto”, which took place on March 10, 1966 at the 36th Geneva Motor Show. 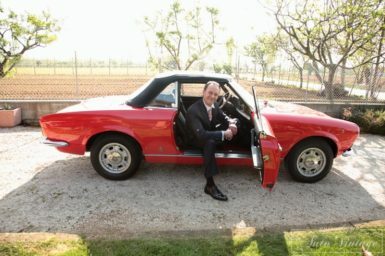 For the launch of the “Duetto” the president Giuseppe Luraghi and the team of “creatives” who at the time constituted the public relations office of Alfa Romeo, concerted an intelligent advertising campaign aimed at creating public events also outside the motor context . 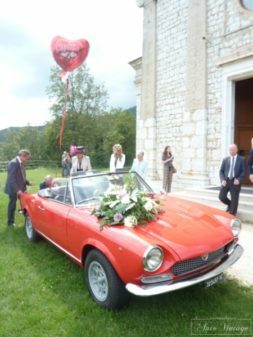 After the debut at the Geneva Motor Show, where the press devoted ample space, the car was presented on various occasions and approached politicians and entrepreneurs, but also the show as Gino Bramieri. 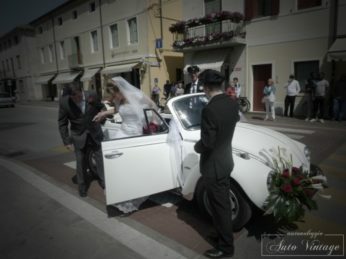 It was also called a week of tests on the roads of Lake Garda, reserved for journalists. 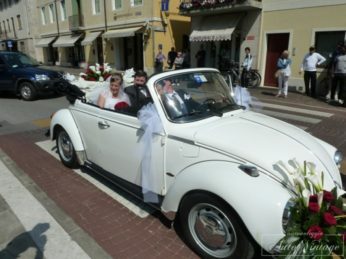 As an introduction to the USA, a cruise was organized with an Atlantic crossing from Genoa to New York, with a stop in Cannes, on the occasion of the film festival of the same name. 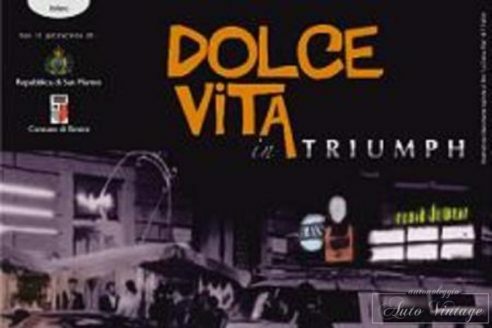 On board the Raffaello turbo-ship, with 1300 guests from the world of fashion, entertainment, music and sport – including Vittorio Gassman, Rossella Falk, Anna Moffo and Marie Laforêt – three specimens of the “Duetto” were embarked, one green , one white and one red, to represent the Italian flag. 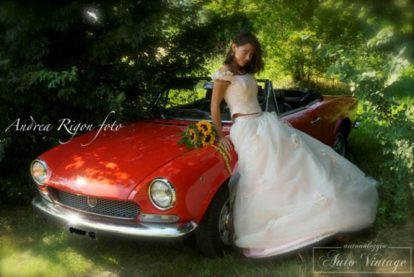 During the cruise there was a lottery, with drawing by lot among the participants, that awarded a “Duetto” prize: the wearer Heidi Gover won, at the time top model of Oleg Cassini. 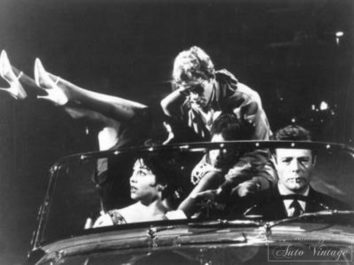 But the great international popularity came in 1967, when the “Duet” became a sort of movie star with the film The Graduate, played with Anne Bancroft and Dustin Hoffman. 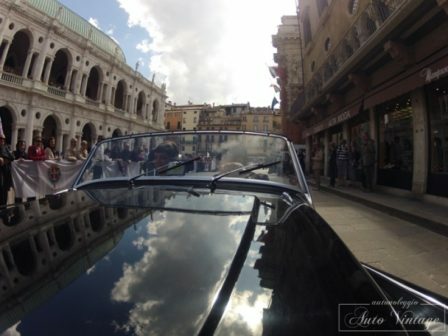 From that first appearance the “Duetto” was used as a stage car in about 300 cinematographic or television works. 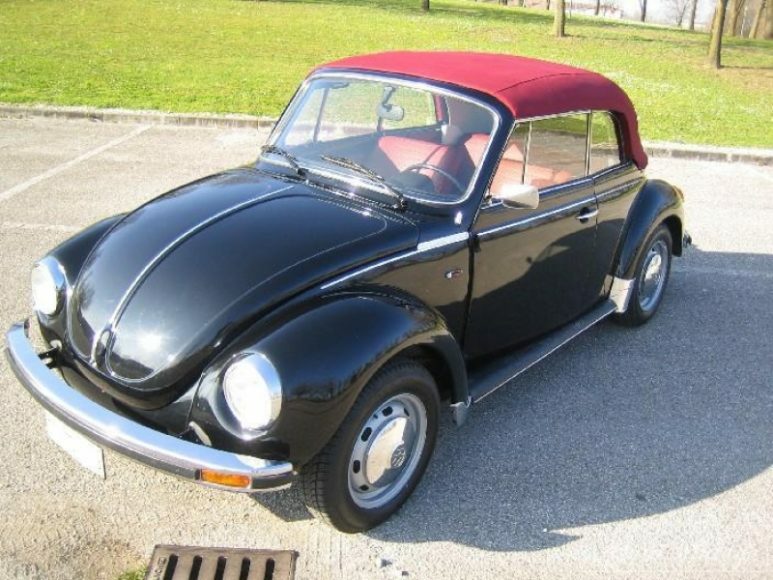 For the choice of the name, the competition entitled «Spider 1600: the name was given. 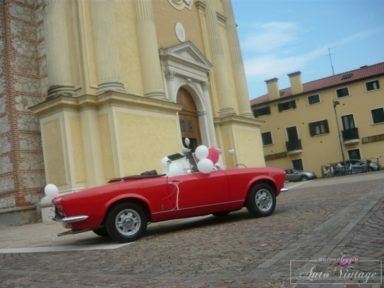 It will become famous »with up for grabs a specimen of the new spider. 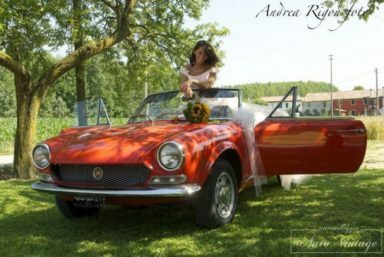 Following a wide distribution of special cards for the proposal of the name in all dealers in Europe, 140,501 cards were sent to Arese, of which about 15,000 from abroad. 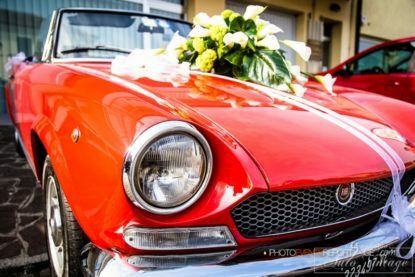 The most popular names were “Pininfarina” and “Pinin”, in honor of the great coachbuilder who just passed away. 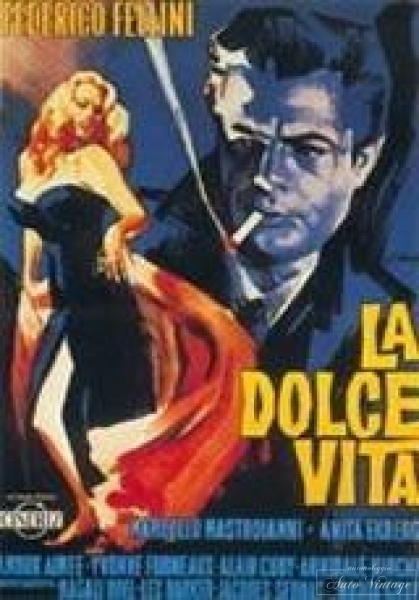 However, the commission judged those names unsuitable and opted for the third classified “Duetto”, a name that “will mean double harmony, in the sense that this machine achieves a harmony between grace and strength and at the same time harmony in pairs”, as the poet Leonardo Sinisgalli, president of the jury, motivated. 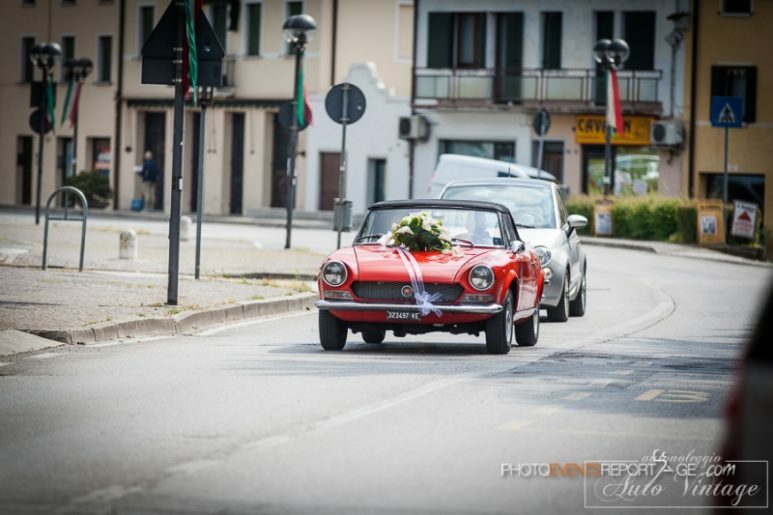 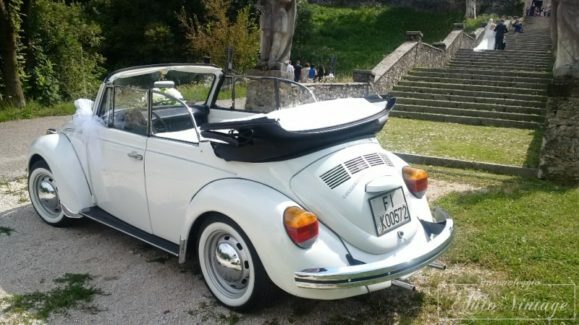 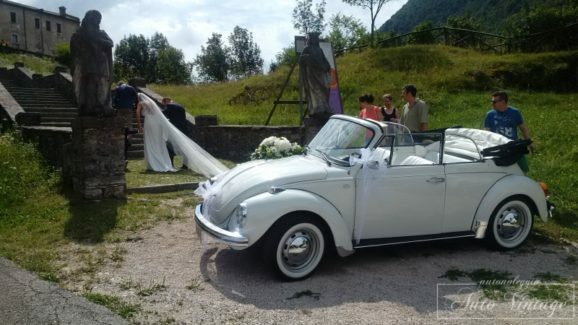 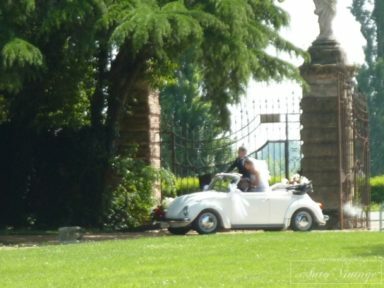 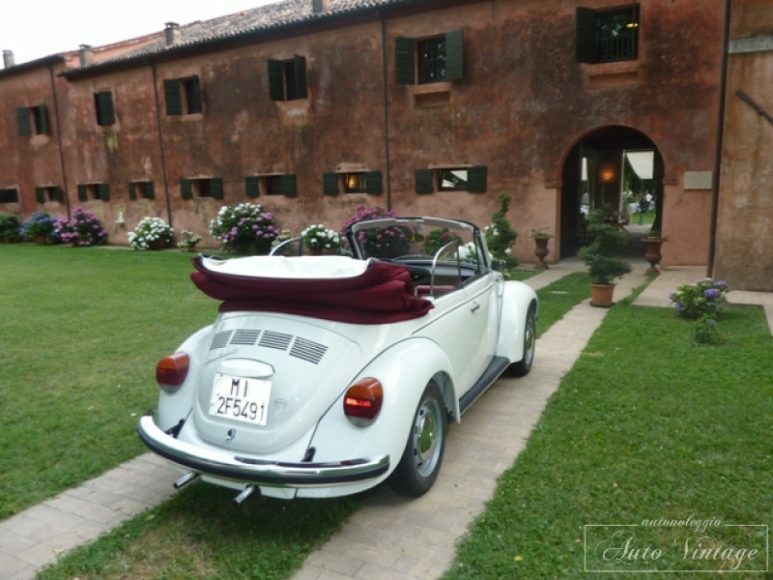 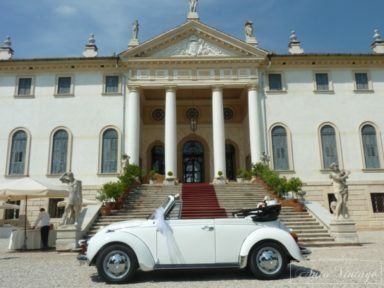 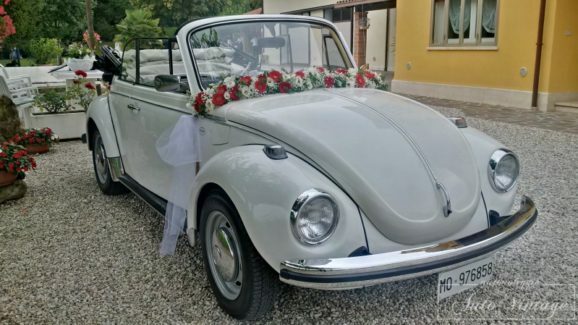 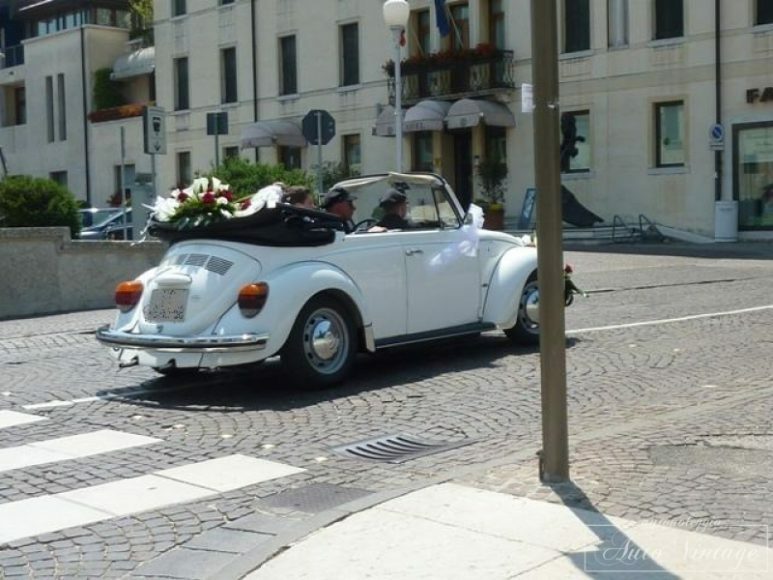 Among the proponents the denomination “Duetto” was drawn by lot the winner of the car put up for grabs, such Guidobaldo Trionfi of Brescia, who withdrew his white spider on June 17, 1966, personally delivered by President Luraghi in the historical site of Portello. 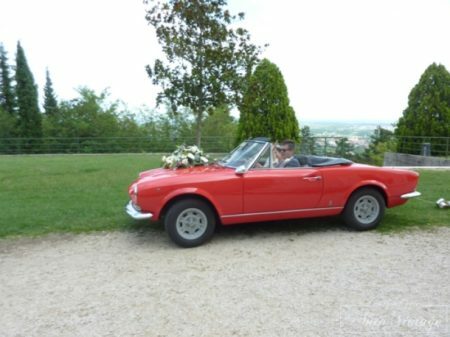 Starting from June 1966, the appellation was officially joined to the 1st series of the “1600 Spider”, but could only be used for the first 190 copies, due to the homonymy with a chocolate snack of the time, whose manufacturer claimed the right to commercial use of the name “Duetto”, obtaining exclusive use by the Court of Milan. 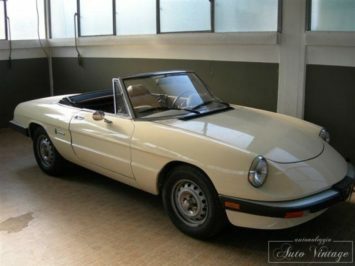 The denomination “Duetto”, therefore, was eliminated, but remained so rooted in the common language that all the subsequent evolutions of the Alfa Romeo spider, descendants of that first model, are normally (even if improperly) identified as “Duetto”. 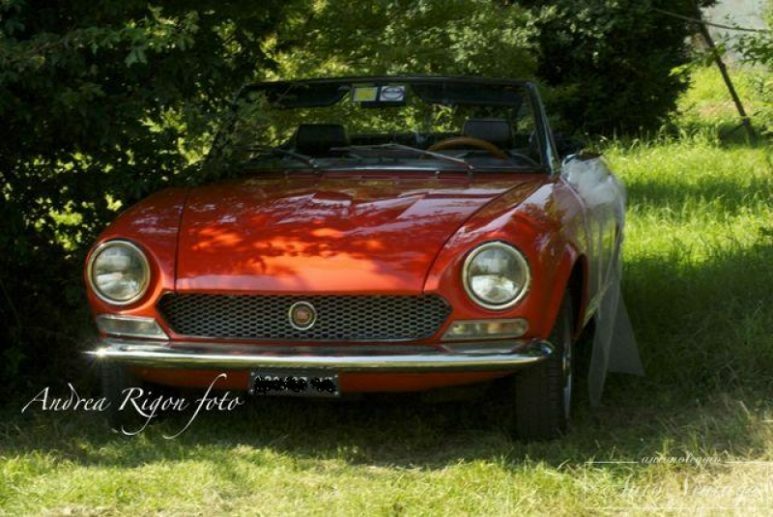 In 1994 the name “Duetto” officially reappeared on the body of the “Spider Veloce CE” which is the last memorial set up of the 4th series, produced in 190 copies for the US market alone.